Internet.bs recently added support for the registration of .ETH blockchain names. 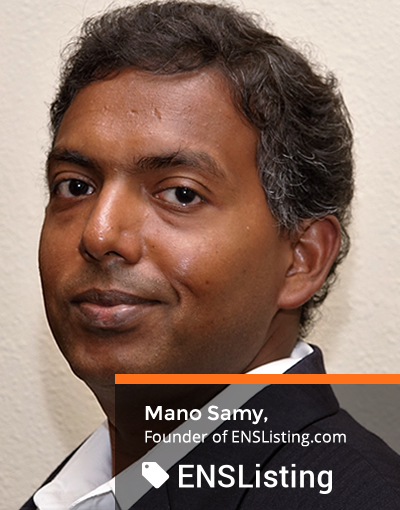 We talk to Mano Samy, founder of ENSListing.com and blockchain naming pioneer about the .ETH name and Ethereum. Tell us a little bit about .ETH and why it is important? “.ETH” (a.k.a ENS) is the naming system for everything within ethereum blockchain (wallets, contracts, files, websites, users, etc), just like how DNS is the naming system for every computer/device connected to the internet. “.ETH” is the first and probably will be the only top level domain within ethereum blockchain (similar to “.com” of the internet). ENS names are in many ways similar to DNS, however there is one significant difference: These names are not issued by ICANN, these are issued and governed by “Ethereum Foundation”, a standards organization that also provides governance for the ethereum blockchain. ENS names 7 characters and more are available for registration since May 2017, and already more than 300,000 names are registered. Premium names (shorter than 7 chars) are expected to launch in 2019. Everyone clearly understands the significance of DNS domain names now, however, knowledge about .ETH names are not widespread. If we had surveyed businesses 25 years ago and suggested that they should reserve their “.com” domain if they think they would ever use internet to promote their business, imagine what their response would have been. If you think that your business/brand will use blockchain in the future, you must secure your “.ETH” domain name now. The pricing is in the same ballpark as that of the DNS names, there is no renewal fee until 2019, and part of the fee you pay goes towards a refundable deposit. CryptoCurrency is just one aspect of Blockchain, and Blockchain as a concept is way bigger and all encompassing. You could imagine Blockchain as “Internet 3.0”, an attempt to build a feature set that is lacking in the core internet (user identities, payment mechanisms, contracts). Few years from now, every business will use some aspects of blockchain either directly or indirectly. There will be blockchain based logins, blockchain based payments, and blockchain enforced escrows, agreements, etc, blockchain will become like today’s HTTPS/SSL, something that every website needs. Crypto currency is like the tokens you get when you enter a gaming arcade, it is the fuel to be used within any blockchain. Every blockchain has their own crypto currency. Ethereum uses “ethers”, or “ETH” for short. Often, several website/projects that want to operate within a blockchain issue their own crypto-currency as a seed funding mechanism for their project (coins, Initial Coin Offerings). These coins are meant to be used within their platform in future. The success/failure of various crypto-currencies/Tokens/Coins will depend on the success of the project/use-case it supports. This is comparable to the .com boom era, where several companies raised funds, only a few survived, and those that survived became giants. On the other hand, “blockchain” itself is like the “internet” that powers all these projects/platforms, and is expected to stay. What projects are you currently working on in the Ethereum blockchain? I work as a blockchain solution architect at Consensys, the largest blockchain consulting firm focusing primarily on Ethereum. As part of Consensys, I’m responsible for evangelizing blockchain to enterprises, and help them adopt and implement their business use cases using ethereum blockchain. Every major corporation is already exploring blockchain, and are at various stages of adoption. ENSListing.com is my passion project. What are some of the challenges facing the .ETH system? What are the main challenges facing Blockchains? Awareness – Not many people are familiar with ENS names, so those that own their trademark/business names/generic names in the “.com” world aren’t yet aware of .ETH names while those are being snatched up by early crypto investors. Complexity – It was a very complex process to register a name. You will need to buy ethereum crypto currency, endure a 5 day auction with complex rules to reserve a name. Thankfully, Internet.bs has simplified this a lot. Ecosystem support – Once you get your name, there are very few uses for it at this moment. You could point it to wallets and receive payments, but you could not use it yet to point to websites, receive email/messages, use it on exchanges, etc. Ecosystem is slowly evolving though. Awareness/Hype – Blockchain is overhyped, and often blockchain tokens are overinflated, while the real awareness of the benefits it can offer is not well understood. Its like, every one heard of Amazon and want to invest in the company, but no one cares to buy real goods from their website because they didn’t know they could do it and it would beneficial. Scalability/Electricity Usage – Bitcoin and Ethereum blockchains already use significant energy (their electricity consumption can power 5.5 million households in USA), and are struggling to keep up with the transaction volumes due to the rapid growth. Various solutions are being worked upon now to address this. Regulatory Framework – Regulatory framework is still evolving. Various countries are weighing in on whether to allow crypto-currencies to be traded in their jurisdictions and what kind of regulations must be in place. How would you recommend that Investors find out more information about .ETH? And finally, which Blockchain development are you most excited about? The biggest blockchain story I’m waiting to hear is the adoption story. Almost every major corporation and every startup business started exploring blockchain last year, we will start to see real world uses of blockchain very soon. And that would be transformative. Can’t wait to see how this all works out.